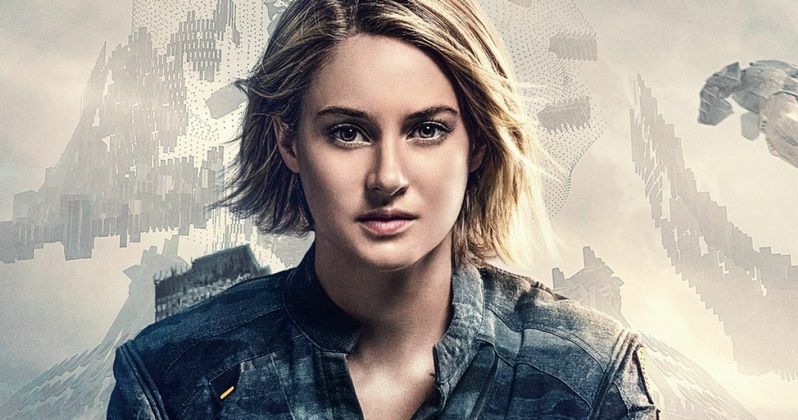 After declining box office results, Lionsgate made the rather shocking decision last summer to release their final Divergent film as a TV movie, which will then lead into a spinoff Divergent TV series. The studio hasn't made any other official announcements about this project since then, with the movie originally slated to hit theaters on July 9, but over the past few months, it's become clear that star Shailene Woodley was not happy with this drastic switch. During a recent red carpet interview, the actress revealed once again that she has no intention of starring in the TV movie or the TV series. Vanity Fair caught up with Shailene Woodley on the red carpet for her new HBO series Big Little Lies, when she was asked if she planned on reprising her iconic role as Tris Prior for the TV movie. Here's what she had to say below in a brief statement. "No. I'm not going to be on the television show." Just days after the news broke in July, Shailene Woodley revealed she was taken by surprise by the announcement, since it happened while she was on a plane and she didn't hear about the TV movie news until she landed. Her co-star Miles Teller also revealed in an interview last summer that he only found out 20 minutes before the news broke online. Still, he wasn't sure either if he would come back to reprise his role as Peter from the first three movies. Here's what he had to say in an August interview with Variety about his potential return in the TV movie. "When we all signed on for the first one we had every intention of finishing it theatrically. We signed on for x amount of movies and you take that all into consideration. We wanted to see that storyline finish. You know, it's moving into a different format. So who knows? We all really enjoyed that time we spent together and those characters." It's interesting that the actor mentioned that all of the actors signed on for a certain amount of movies, but perhaps now they aren't beholden to those contracts since the studio is making it a TV movie. That is only speculation for now, but it may explain how Shailene Woodley and Miles Teller could presumably not show up for this finale, if they didn't want to. It's possible that they both end up returning for the final TV movie, but not the actual spin-off series, but since nothing official has been announced about the TV movie or the series, including when production may happen, nothing seems to be set in stone at this time. Lee Toland Krieger (The Age of Adaline) signed on to replace Robert Schwentke at the helm of this final movie, but then a report surfaced in March that Lionsgate was slashing the budget, just after the third movie Ascendant underperformed in theaters. The movies were never as big as contemporaries such as The Hunger Games at the box office, but Ascendant marked a big decline that seemingly set these chain of events in motion. Divergent earned $150.9 million domestic and $288.8 million worldwide from an $85 million budget back in 2014, while the second movie, The Divergent Series: Insurgent, came in just below its predecessor's domestic take ($130.1 million), but made more overall globally ($297.2 million). Last year's The Divergent Series: Allegiant, however, only made $66.1 million domestically $179.2 million worldwide, which apparently forced Lionsgate to explore this TV movie and spin-off series option. It still hasn't been confirmed if the TV movie will be directed by Lee Toland Krieger, or if it will use the script that was worked on my Noah Oppenheim, Bill Collage, Adam Cooper and Stephen Chbosky, based on Veronica Roth's novel. Regardless of who shows up to star, of if this final movie ever happens, the Divergent franchise will likely be the last to split the third novel in a book trilogy into two movies, and may end up serving as a cautionary tale about the pitfalls franchises can fall into. Hopefully we'll find out more about the fate of The Divergent Series: Ascendant soon.